A collection from Tonic II. Ideal Standard is strengthening its presence in the region and an upcoming showroom in Dubai will have a specification centre in addition to showcasing its contemporary range of products. Having charted out an ambitious plan for growth, Ideal Standard is set to open a number of showrooms in the region, starting with the UAE. The leading provider of innovative bathroom solutions will soon launch a new showroom in Dubai, which will also include a specification centre for architects and designers. The showroom, set to open in mid-2016, will be located on Shaikh Zayed Road. “We are strengthening our presence here,” says Kamal Chehade, area sales director, Ideal Standard Mena. The company recently established its regional headquarters in Dubai to strengthen its position in the market as well as to support its customers. “We felt the need to show the market that we are here to stay,” he says. Chehade says the specification centre will provide the perfect ambiance for any designer wishing to put together ideas, examine a wide range of products and conceptualise ideas with the help of Ideal Standard professionals. Following the opening of the Dubai facility, Ideal Standard intends to open showrooms in Qatar next year and Saudi Arabia the following year. 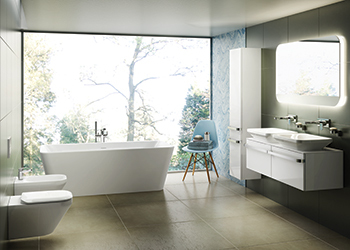 Ideal Standard offers a wide spectrum of bathroom solutions, ranging from ceramics, brassware fittings and shower kits to bathtubs, furniture and shower trays. All these products are produced under the company’s flagship brand Ideal Standard as well as its other leading European brands such as Jado, Armitage Shanks and American Standard. The company recently introduced a number of new products in the region including the revolutionary AquaBlade flush technology and Tonic II total bathroom range. 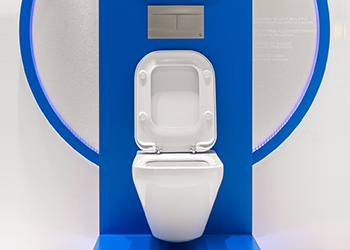 AquaBlade is a newly engineered system of channels to create a cascading wall of water from the top of the toilet bowl opening, which gives an optimum water flow that covers every inch of the ceramic, keeping the toilet bowl immaculately clean, he explains. Tonic II, meanwhile, with its refined soft geometric design and clean, beautiful lines, offers a broad choice of solutions and combinations of harmonious, contemporary ceramics, fittings, furniture and bathtubs. Created by German design studio Artefakt, the Tonic II collection won an IF Design award in 2015. In the region, Ideal Standard’s main business comes from projects. “Our ongoing projects include Akoya by Damac in Dubai. This is one of the largest projects in the UAE at the moment and we are supplying a substantial number of units to the development,” he says. “We are witnessing growth in the Middle East and the Gulf region. Over the next five years, we hope to see huge growth in the region coming from Saudi Arabia, the UAE and Qatar,” Chehade adds. The company, which has seen 15 to 20 per cent growth year-on-year, hopes to quadruple its growth over the next five years. Chehade, however, admits that Ideal Standard has witnessed a slight slowdown in business over the past few months because of the low oil prices. Ideal Standard’s biggest market in the region is Saudi Arabia and it is investing substantially in the market in the hope of winning good returns, according to Chehade. “After Saudi Arabia, our next big markets are Qatar and the UAE,” he adds. Ideal Standard International is a privately owned company headquartered in Brussels, Belgium, operating in more than 30 countries across Europe, Middle East and Africa. Its sister company Ideal Standard Mena focuses on growth and business opportunities of the Middle East, Egypt and Africa.